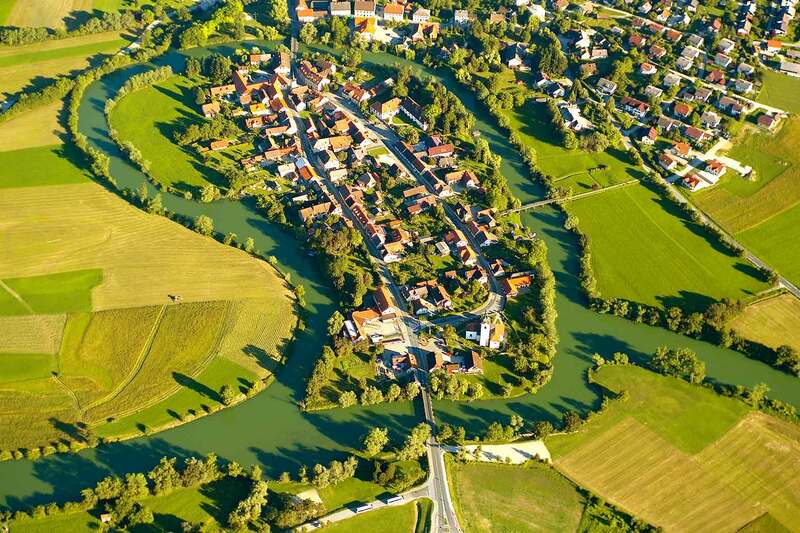 Kostanjevica na Krki is not only Slovenia’s smallest town, but also the only one which stands on a river island, with the green Krka winding its way around it. The meandering river offers charming reflections of the Gorjanci hills, about which stories were written by Janez Trdina; the Krka flows slowly and lazily, and in summer generously offers refreshment to hot swimmers and beckons you over for a boat trip around the town. The Venice of Dolenjska has its own gondolas – characteristic wooden boats that glide silently over the water and let the tired oarsman rest peacefully by the river bank. Kostanjevica na Krki is romantic and beautiful; in the local area you can enjoy walking, cycling and horse riding, or you can go out exploring the diverse cultural offer. 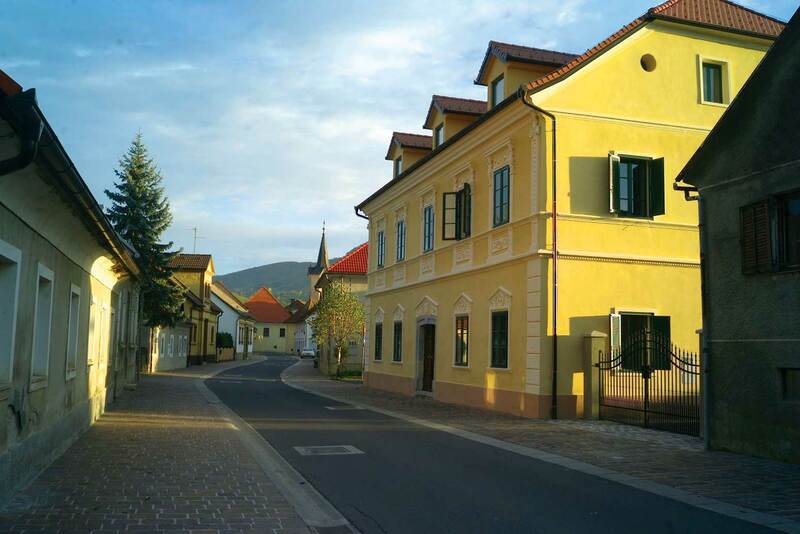 Only a small town offers so much luxury in such a small space – the art of sculpture at Forma Viva, a look around the Cistercian monastery or a visit to the Božidar Jakac Gallery. Last but not least, Kostanjevica na Krki is a treasure for food lovers – you can enjoy local specialities, Cviček and high-quality wines, freshly picked fruit and local fruit juices. The Vila Castanea is in the very heart of the old town, and is an ideal place to relax, enjoy the natural beauty of the soft Dolenjska landscape, the picturesque wine-growing hills and the soothing Krka. This grand town house from the end of the 19th century is a protected landmark of local importance with a diverse and interesting history – as an inn, residential house and villa. It boasts a richly decorated front facade, an arched ground floor, floors made of local stone and an arcaded interior courtyard in the shade of a mighty chestnut tree. It dominates the old part of the town; its windows open onto wonderful views of the soft Dolenjska hills, the sleepy Krka and the town. Breathe in the fresh spring air, enjoy the scent of newly mown grass in late summer and allow yourself to be tempted by baked chestnuts from the surrounding woodlands. Let the Vila Castanea be yours alone! The exclusive hire of the villa for the organisation of a business event or wedding will guarantee you complete privacy; thus your stay and that of your guests will be adapted to your wishes. You are warmly welcome. In our villa, which is pleasantly cool in summer and comfortably warm in spring and autumn, we have created seven twin bedrooms and two spacious family rooms with a bath. The rooms are a reflection of the character of bourgeois villas – have you ever wanted to sleep in a four-poster bed? – but are fully equipped with modern facilities from natural materials, with an eye for detail and everything dictated by the comforts of the 21st century. You will enjoy breakfast beneath the vaulted ceiling of the breakfast room, warmed by an open fire on cold mornings, with the scent of the logs. Our breakfasts are rich and healthy and made from carefully prepared ingredients. Fresh seasonal fruit, vegetables and meat from local farms, home-made jam and honey, fresh bread and pastries. You will be served local specialities in the afternoons and a diverse offer of Slovenian wine in the evenings. On warmer days, you are warmly invited to enjoy a fragrant coffee, cake or a glass of fresh fruit juice in the shade of the chestnut tree. Our autumn days in Kostanjevica na Krka are full of the scent of cooked chestnuts, local ‘potica’ and cakes. Have you ever heard of chestnut cake? Castaneina is something really special, made to a local recipe from local ingredients and fresh daily.